It was a brutal, close game against a top-tier team, and the Houston Rockets pulled through. The Boston Celtics played a white-hot game complete with deadly shooting and the Rockets pulled through. Boston closed the first half on a 10-0 run and were up nearly the entire second half. It still wasn't enough to close the door on the Houston Rockets. Harden and his crew may not have played their best game but they held on and never let go of the rope. The clawed and scratched their way to their 15th win in a row in an amazing thriller. The Celtics shot 54% from three point range. This is not normal. Kudos to a team with the 18th best defense in the league for finding open looks, and the Rockets brought much of this on themselves. Be that as it may, the Rockets weathered a hell of a storm. It took them until the end of the game to crawl up to their very respectable 38.8% up from under 30% midway through. The story of this game was excitement. More than any other game in this win streak, the Celtics actually challenged the Rockets, grabbed a lead forcefully and held onto it, and traded leads at the end of the game. This one was decided by a pair of steals, capped by Trevor Ariza's critical steal and layup in the waning minutes. The rest of the way, it was primarily a free throws game, with startling misses from the Rockets and some biffed intentional misses to boot. The Celtics even had a chance to tie it with 2.8 seconds left. The heroes for the Rockets somehow didn't include Chris Paul, who put up an inefficient 15 and 7, or Clint Capela, who managed to doink an open dunk and put up a ledgie on two consecutive possessions. James Harden was a hero, as always, with 26 points, 7 rebounds and 10 assists. He also cooked the Celtics on several possessions late in the game to keep the Rockets in striking range. It's exceedingly rare that Harden isn't a key force in a Rockets win, and this was no exception. The surprises were Trevor Ariza and Eric Gordon. 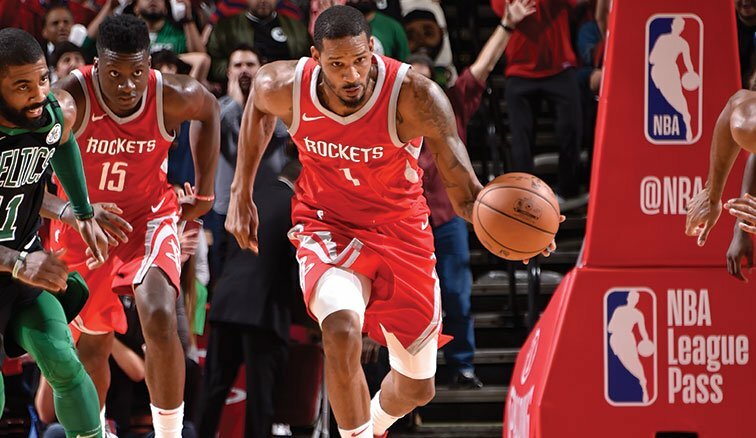 Gordon's 7-11 from deep and game-high 29 points kept the Rockets in the game when Marcus Morris (5-7 from three, 21 points) was unguardable. This is what Eric Gordon was hired to do and it's what he did tonight. Without his shooting, the team would have been sunk. For his part, Trevor Ariza contributed 21 points but more importantly added 3 crucial steals. He was active and persistent around the basket and was a large part of the sealing of this game. On a night when players like Chris Paul and Nene were less than stellar, the ddepth of this Rockets team showed its true value. Someone stepped up. Someone held onto the lifeline. Someone clawed their way back to victory. This may not have been the prettiest Rockets win, but it was one of the most impressive. This team demands nothing less than a victory in every outing, even if they have to drag themselves into the mud to get it.